Are Restoration Fleets Headed Through Your State? Is your state involved in the regional electric sector mutual assistance fleet movements? 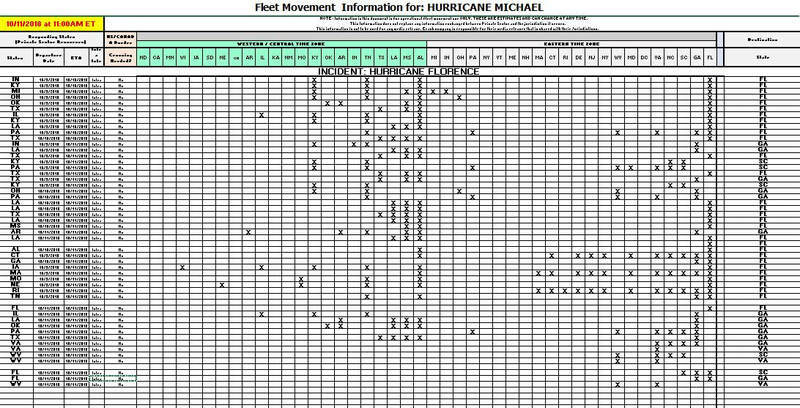 Use the spreadsheet below to see....If so, please alert your police, emergency managers, and transportation officials to be on the look out to help expedite them through your state. 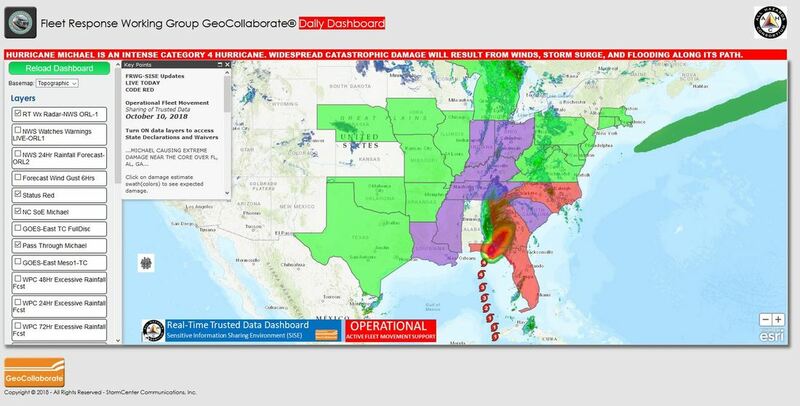 Helps utilities and business understand where areas of HIGH WINDS IMPACT may occur. NOTE; Data subject to change without notice. In anticipation of the devastation that may be caused by Hurricane Michael, a Presidential Declaration of Emergency under the Robert T. Stafford Disaster Relief and Emergency Assistance Act ("Stafford Act") (42 U.S.C. 5121 et seq. ), has been declared (EM-3405) for Florida. Utility vehicles traveling in convoys to the state of Florida in response to the restoration of electric, water, or other utility services critical to life and safety as a result of Hurricane Michael, may bypass all open weigh stations within the state of Illinois. Search and rescue vehicles traveling in convoy for response to Hurricane Michael may bypass all open weigh stations within the state of Illinois. The lead vehicle in the convoy must pull into the scale and advise the Truck Weighing Inspector, or ISP Officer in the scale of the convoy and their intended destination. Vehicles exceeding legal size and weight limits must comply with Illinois permitting requirements and order a permit online through the ITAP system. FL issues transportation waivers to bypass weight stations.